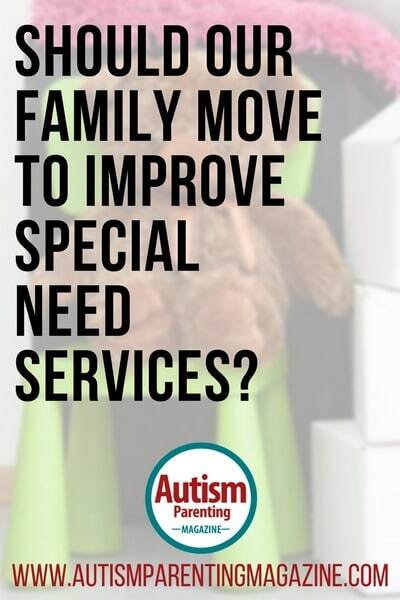 Should Our Family Move to Improve Special Need Services? Review your cash flow to determine the largest mortgage you can afford, and still be able to live in a way you would like. Have a real estate agent provide you an idea of the sales price of your house, so you know if you can pay off your current mortgage and use any remaining equity as a down payment on your next home. Research the real estate prices in the school district you are considering. Are you able to afford the pricing in that neighborhood for the size house that will accommodate your family? If your mortgage will be increasing due to an increase in housing prices, or if your property taxes will rise, please calculate the impact of having a higher mortgage payment on your future retirement, as well as your ability to financially provide for your daughter’s lifetime support needs. Set an appointment with the school you expect to attend, and confirm the class and services your daughter will qualify to receive. It is important to know that your daughter will receive those services, especially if you are moving your family for that specific purpose. Contact a local support group to try and find parents of children who may be attending that school to ensure the services will meet your expectations. In some areas, the local autism society will be a good resource to help you learn about the school and its services. It is certainly a big decision to move your family to improve your daughter’s educational experience, but it is not uncommon. I always suggest that you calculate the financial impact to your family in making a move, and at the same time weigh that against the intangibles of receiving improved services for your daughter and the impact that may have on her development. Good luck with your decision!! Necessary school options, supports, services and insurance coverages are not equal across the board, this is what drives families to relocate! We want our children to succeed, grow, flourish, and be the best they can be, but if you live in a city or state that doesn’t provide adequate (or any) services for your child to thrive in, what options are families left with? Not everyone can afford to relocate their family (not taking into account all the other factors involved in that decision), but when you observe your child lagging behind, regressing, or constantly struggling while their peers are thriving with support systems in the town next door, it’s discouraging to say the least.